So if you pursue the same goals but want to save some money you always can turn to alternative tools. Here you will find the overview of competitive tools you might want to try instead of BuzzSumo or to use at least some of its functions (like alternative to Buzzsumo). No one will be surprised that these tools may not completely replace all BuzzSumo functions, but each of them is an effective instrument and often cheaper (or even free) solution. 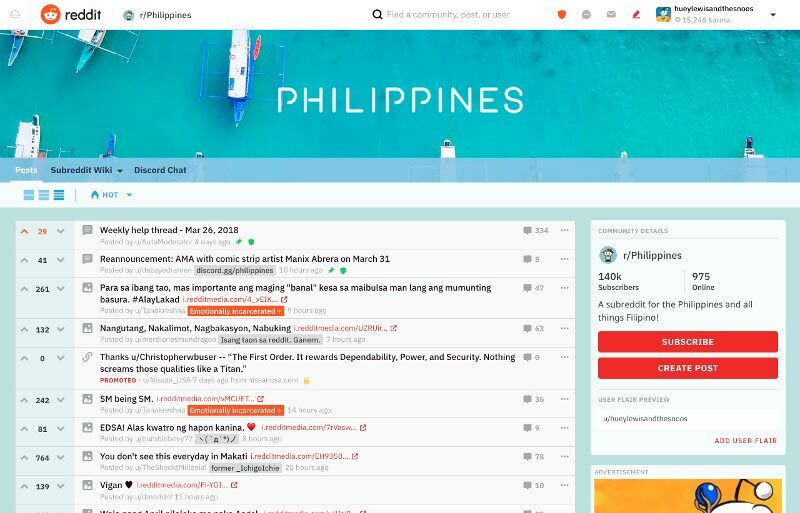 Today popsters.us is one of the best statistics and content analysis tool for social networking communities (both your own and other’s accounts). Now it works with Facebook, Instagram, Twitter, YouTube, Pinterest, Coub, Flickr, Google+, Vk, Ok. The team doesn’t stop their efforts to make it better. Also, they constantly increase the number of analyzed social networks. So you can detect the most popular publications almost without any effort, as well as you will see useful statistics of any account. And sure you will be able to export to XLSX. PPTX, PDF. It gives the ability to find popular “viral posts” and the most discussed publications. This tool can be used with confidence as an Buzzsumo alternative. Also you can analyze other people’s accounts in social networks or your own ones, and compare them graphically by various indicators etc. In addition to the “evergreen” themes that do not lose relevance and remain in demand for a long time, there are also trend themes. The difference is that demand for the first is easy to calculate, but there is very little data on what is gaining momentum right now. Therefore, the competition in the search for such topics is much higher, and you can not only get into the bull’s-eye with the interests of the audience, but also grab a good piece of traffic pie. 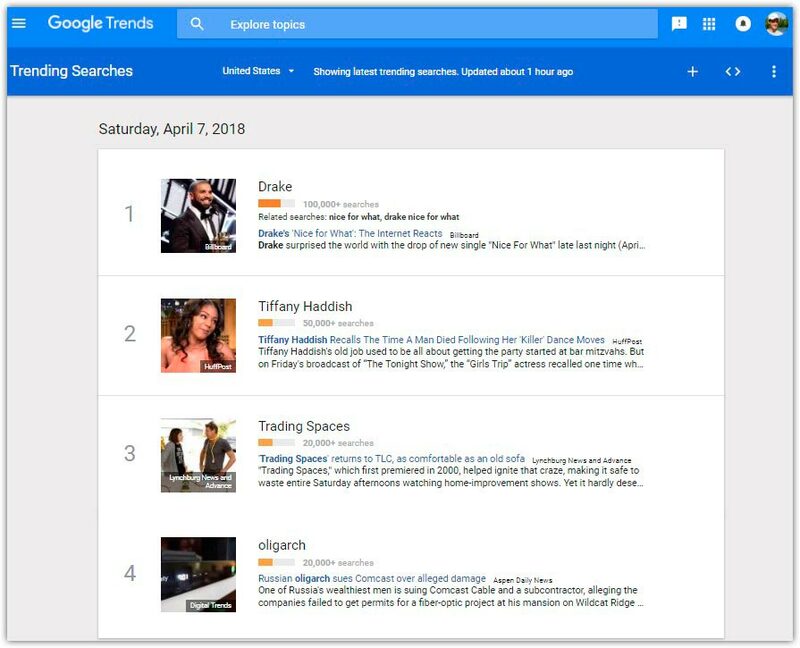 Google Trends – a free tool from Google, which will be interesting not only to the curious personalities, but also can be considered as a useful tool for marketers. It can be used to detect trends at the moment, compare the demand graphs for different keywords, view information on different countries, etc. including popular on YouTube. As you see, this tool has very useful functions, and it can be a partial Buzzsumo alternative. 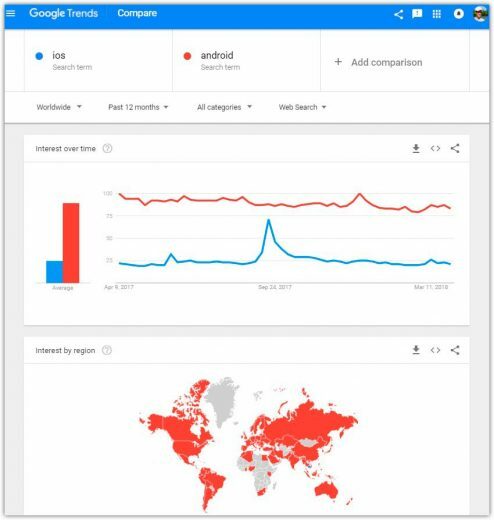 You can track the popularity of a particular request over a period of time up to 2004. Of course not everyone needs to dig so far, but sure it can be very useful to see the dynamics of the last year and a half. For example, if you create a narrow-focused site and choose between several options. Newsbreaks can be a fertile ground for cultivating the popularity of your resource, especially if you adapt them correctly. There is such a tool designed specifically for publishing slides – an ideal format for visual demonstration of voluminous information in a concise and understandable manner. Tool is very popular all over the world. 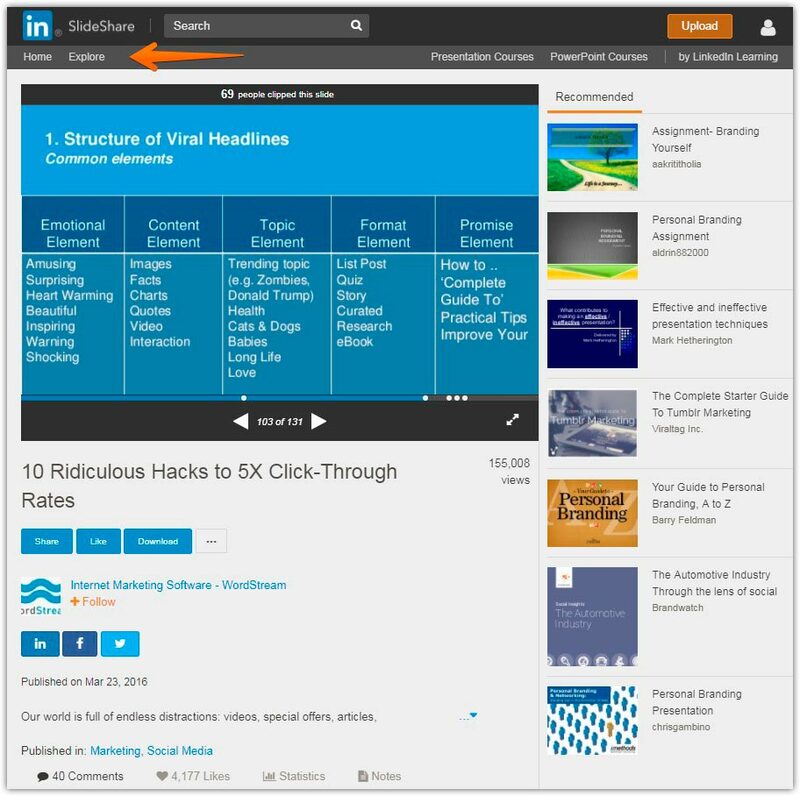 Many people use Slideshare to store a variety of information, mainly for various kinds of speeches and educational purposes. Therefore, the concentration of useful data here is much higher than on other social sites. Ahrefs is known as a powerful tool for analyzing backlinks, but, developers are constantly expanding and improving the functionality of the tool, so it is good not only because of this feature. 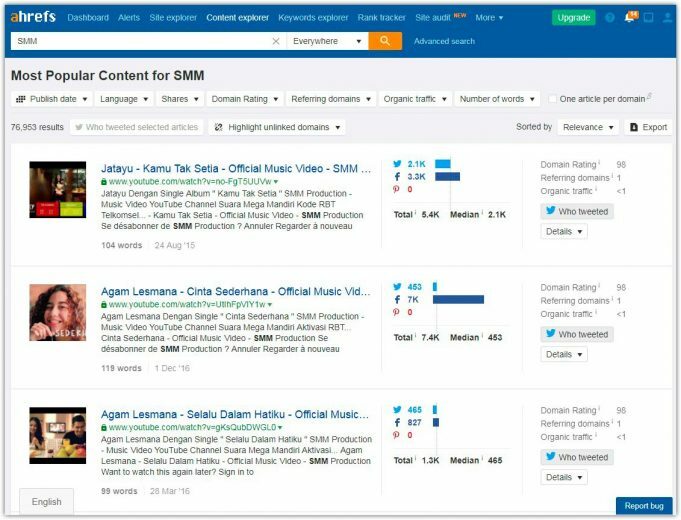 Content Explorer is available in the paid account, and can be very useful when searching for ideas for new content. You can sort the results by publication date (choose the desired period), social signals, the number of incoming links, organic traffic and a number of other parameters. It’s a good way to find ideas for articles that bring traffic and are popular in social networks. We have to remember that BuzzSumo focuses only on backlinks and social campaigns. If we speak about Ahrefs then we have to consider that it also allows tracking trend content on traffic. 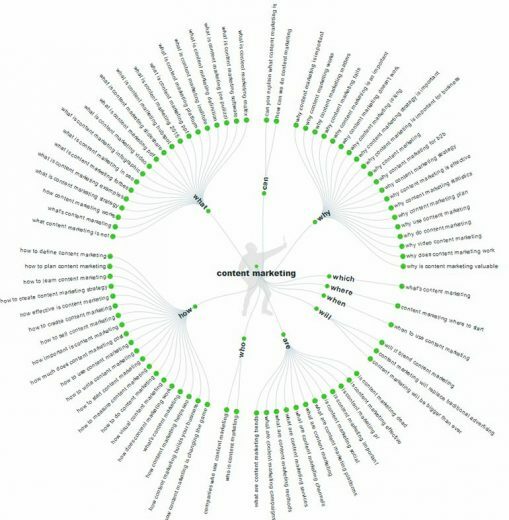 And it reveals more information for each publication: keywords, ranking position, the amount of used traffic, and more other details. You can consider the work of competitors as tips for generating of genius ideas and to get muse as well. For the matter of that link building, it will show you the ability to link to sites that are not yet linked to you. 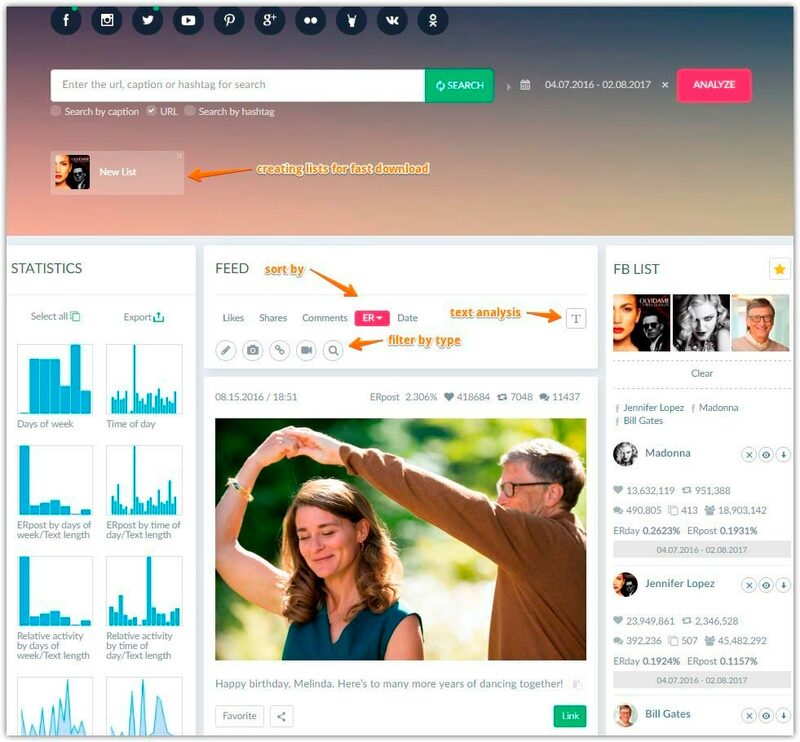 Some features of the tool can be used as nice alternative to BuzzSumo. You will receive a timely e-mail notification as soon as a new link opportunity appears. Thus, it is easy to group them by topic and distribute them across clusters. An ideal search engine for content marketers. It issues materials, which are relevant right now, and makes it possible to repost it in many of your accounts. 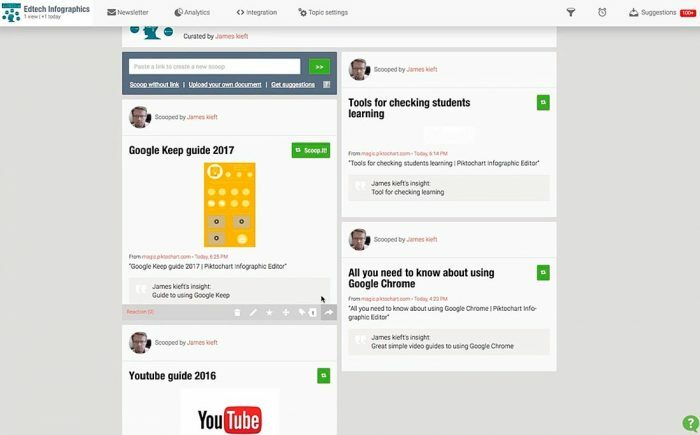 In addition, the web application https://drumup.io makes a schedule for your content and reminds you not to forget to post the material on time. Using the search parameters, Scoop finds the relevant material. It is extremely useful thing, especially if you buy a paid version of the program. https://scoop.it is a forceful and convenient tool for creating content. 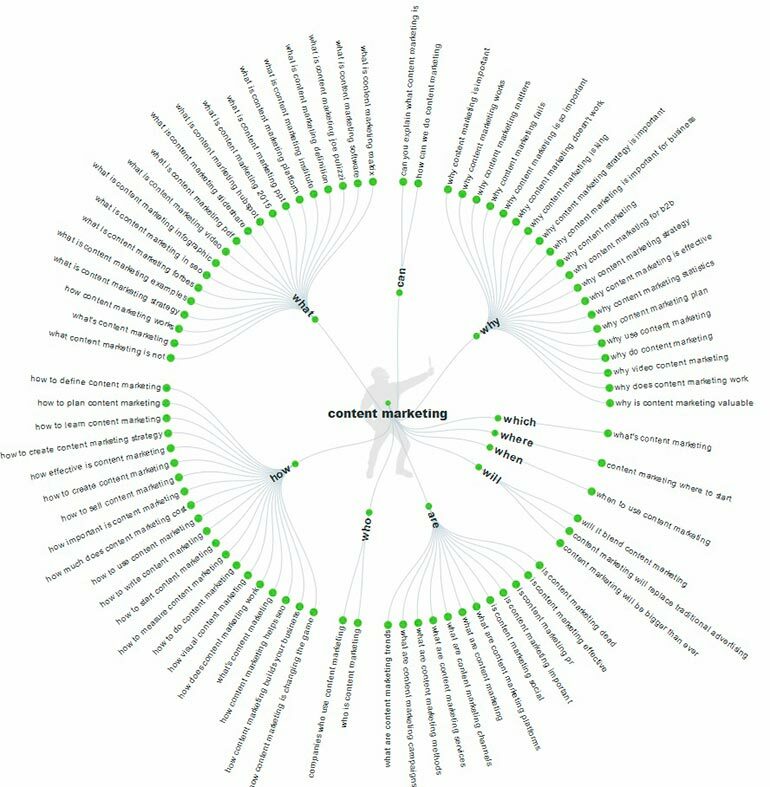 It functions by scanning every day a huge amount of web pages, and then grouping content according to the most relevant themes. It helps users to edit, filter and share relevant content easily. Scoop.it is a good variant for increasing the effectiveness for content marketers and other professionals who are engaged in content generating for various goals. It performs many functions and gives you the opportunity to create and maintain brand awareness, as well as discover and distribute info on the Internet. And you know… It is much cheaper than BuzzSumo. No wonder this resource is called the main page of the Internet: this title is much deserved. And if you’ve never been at https://www.reddit.com, then you should definitely fill this gap. I’m not saying that this is the most convenient or understandable platform for the work: getting the right result can take a lot of time. However, after you learn to work with the resource, you will understand that Reddit is just a golden source for inspiration. 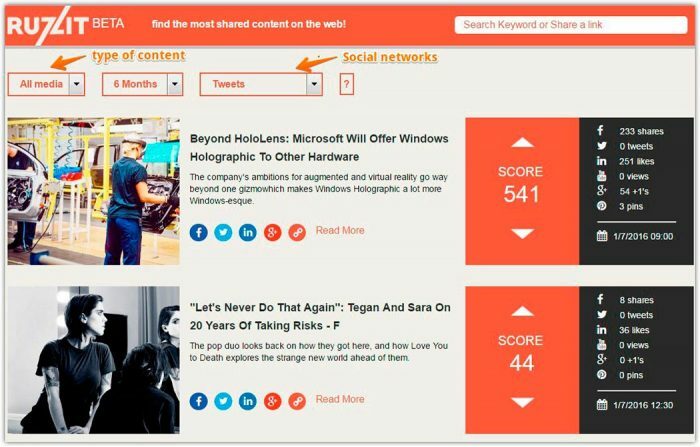 Unlike other platforms, the content submitted at Reddit is selected according to the relevance criteria and user estimates. On the main page of the site you can get quick access to trendy and popular messages, each of them has certain indicators of popularity. This simple combination makes Reddit the ideal platform for searching for trend content, as you get the most “tasty” information at a given time. This is a good source of popular content. You can use it to solve part of your tasks and use it as a free Buzzsumo alternative. When you first use Reddit, you will not receive specific mailings until you add them manually. You should click the “Edit” button in the upper right corner and select the content of interest. After receiving quality information, you need to optimize it for search engines. This is another effective platform for the search for quality content. Here in https://www.ruzzit.com you can operate with filters, categories, as well as the type of information supplied from social networks. 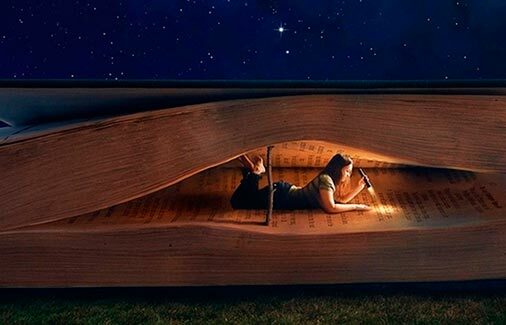 The system works quickly: in a short time you will get the information you need. Unfortunately, the functions of the site are rather limited. Here you can check the popularity of the content and get some analytical calculations, but no more. However, you can get the content here for free. In this article we examined the most convenient and effective alternatives to BuzzSumo. Some of them are free. Some of the features of these tools are completely unique and will help you to simplify complex tasks. I really hope that this information will be useful to you! P.S If you really liked the article, please share it with your friends on social networks. I’ll be very grateful. Top 9 Alternatives to Klout: Free and Paid tools to measure online Influence.